MY BFF MOVED AWAY…AND I’VE GOT A NEW BFF! My BFF, Sophia, moved away six months ago and I really miss her. But then a new girl named Madison came to school and we’ve become really good friends. The only problem is if I become BFFs with Madison, then Sophia will probably get mad. I’m scared to tell her the next time we Skype because she might hang up on me. Madison’s BFF from her old school doesn’t know me either and she’ll also be mad at Madison if we become BFFs! But can’t you have more than just one BFF, even if they both don’t know each other? First of all, I’m sorry that your BFF moved away! I’m sure that this has been very hard for both of you. It’s SO cool that you’re able to Skype, though. I totally know it’s not the same, but it’s better than not being able to chat at all. I get why you’re worried about how Sophia will feel when she finds out about your new BFF, Madison. But let’s switch things up a bit. Sophia’s at a brand new school, in a totally different place. She doesn’t know anyone. She’s so alone. Then she connects with a new girl. Let’s call her Emily. Finally, Sophia has someone to talk to. She gets invited over to Emily’s house and they enjoy watching the same shows. Emily helps her fit in at her new school. Basically…Sophia’s found a new BFF after she’s moved away. When you find out…how would you feel? Would you be mad? I doubt it. You might feel a bit hurt. You might even feel replaced. The thing is, you’re still her BFF, but you can’t be with her at school, go shopping with her and go to movies together. I’m not trying to rub it in. I’m just trying to say your relationship with Sophia is going to change. And meanwhile, while you guys figure out how to stay BFFs, she is going to need a new BFF wherever she is. Just like YOU deserve to have a new BFF now that Sophia has moved. And your new friend, Madison, deserves to have you! So YES, a person can have two BFFs, even if those BFFs don’t know each other! Just take me, Chloe and Zoey for example. We didn’t know each other at first, but then we all became best friends! I think you should be honest with Sophia. And if she does have a strong reaction at first, like hanging up on you during your Skype call, just give her a little time to let it sink in. After she chills out and apologizes (hopefully! ), then make sure you let her know that she’s still your BFF and you want to keep it that way. You could also say you want to see pictures of her new friends and maybe even meet them over Skype some time. However, make sure she’s ready and willing to listen, since you also deserve a friend who doesn’t hang up on you! And make sure SHE knows that you want HER to make new friends, too! 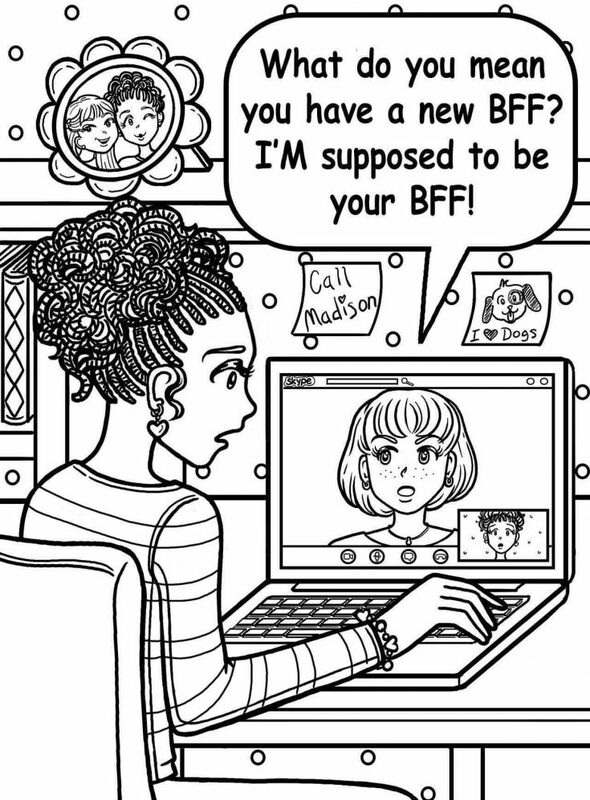 Hey readers, how do you guys feel when your BFF has a good friend you don’t know? Do you have any advice for Friendship Frustrations? I feel so like the right now. But Nikki’s advice helped me a lot. sometimes you fell alone and you need a girl right there you need a bff is not only here she moved away it meand you need a friend it dosent have to be a bff just a friend.